Are your children curious about their family history? Do they understand how their cousins, aunts, uncles and grandparents are related to them? Spend an afternoon teaching them more about their extended family with this easy and creative family tree project. Making a family tree can be as simple or complex as you want, and it’s a fun way for kids to see how they fit into the context of the family. Start with a very basic tree, then expand it as much as you like. 1. Take out a piece of paper or open to a new page in your journal or notebook. 2. Draw a large tree with a trunk, several branches and lots of leaves (you can add color and more details later). Starting at the bottom of the tree, draw apples (or oranges or birds or whatever you choose to represent family members) for yourself and your brothers and sisters. Write each person’s name in an individual apple. 3. On the branch above, draw two more apples for your parents and write “Mom” and “Dad” in them. Draw a line connecting your parents to you and your siblings. For blended families, don’t forget to add in step-parents and step-brothers and sisters. 5. Enhance your family tree by adding color and detail to the picture. Add more leaves and fill them in with fall colors or draw a landscape around the tree. Be artistic and make the tree represent how you see your family. If you love to spend summers at the lake with your family, draw the tree next to a boat dock. If you like to read books together, draw a stack of your favorite books next to the trunk of the tree. Have fun with it! 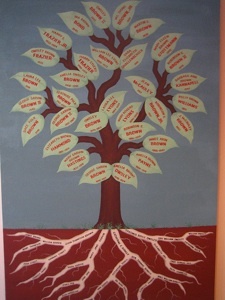 Have you ever done a family tree project with your children? What did they enjoy the most? Next: Next post: Brown Bag Boredom Already? How to keep school lunch interesting.